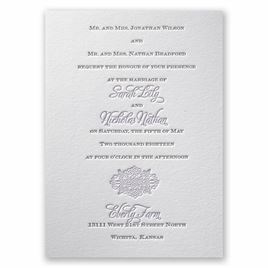 Simply perfect for your elegant wedding style, this letterpress wedding invitation with intricate filigree accent needs nothing more than your wedding details to make it absolutely stunning. Design and wording are printed in your choice of colors and fonts. 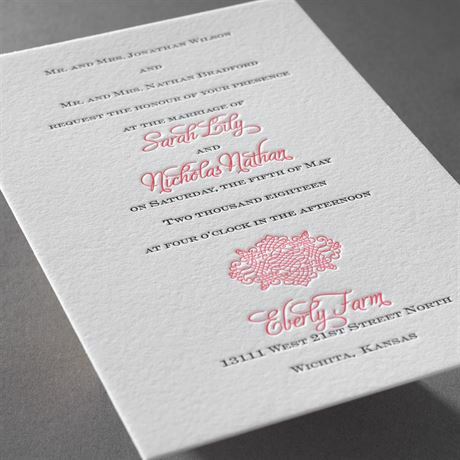 Invitations include 100% cotton inner and outer envelopes. Thank you so much Invitations by Dawn. Our invitations were stunning and timeless. In love with every detail about our invitations. The product was just beautiful and exactly as described. In fact, I ordered without even getting a sample and was very very pleasantly surprised at the wonderful quality. They even gave us an extra invitation which was great because we framed it. There was a little issue with envelopes being slightly backordered so make sure you order with an extra week or two to play with. I didn't and was cutting it close but customer service was very nice about it and got everything to me as quickly as possible.